With his growing profile, it is somewhat surprising that Christchurch artist, designer and muralist Joel Hart’s Dopamine, at Fiksate until 26 April, it will be only his second solo exhibition. His captivating compositions of alluring, mysterious portraits amid busy, detailed surroundings of patterns, text and gestural elements, have gained a widespread following, whether on walls, canvas or various other surfaces. Yet, a show of a cohesive body of new work, within a specialised gallery setting, is still a relatively unfamiliar experience, albeit one Hart is relishing. Dopamine draws on Hart’s interest in exploring materials and processes to elicit a sensory response from his audience. The show’s title is drawn from a neurotransmitter found in the brain, responsible for various emotions and behaviours, including our ability to see and act towards reward, a fitting reference for works that invite inspection and reward examination. This ability is further developed in the exploration of surfaces and materials. Already adept at adapting processes to work in various settings, watching Hart employ screen printing techniques within his mural work is always satisfying, his studio practice has afforded the opportunity to extend into reflective, shiny and layered supports and surfaces. This materiality, along with the gestural presence of swathes of paint and drips of aerosol, ensures the recontextualised imagery and text from the contrasting worlds of natural science, high fashion and urban mark-making (influences drawn from Hart’s background as a graphic designer, a formative experience still clearly evident in his compositional qualities), are ever more enticing and dynamic. The cumulative effect is one of almost instant sensory attraction. 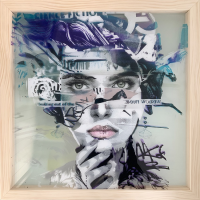 This effect, in combination with the imagery cut from magazines and newspapers, affords reflection around the impact of advertising and stylised imagery in contemporary culture, without any heavy-handed exposition. While representing a concerted period of work, Dopamine also suggests new directions for Hart. The subtly shifting, layered works on Perspex sheets and illuminated light boxes provide a hint at a new interest in sculptural approaches that may expand his public practice in new areas, outside of his mural work. Hart’s inquisitive, hands-on approach, coupled with his almost fearless ability to overcome practical problems, ensures such a shift is sure to be compelling. As such, Dopamine may prove to be the beginning of the further evolution of Joel Hart. Dopamine is at Fiksate Gallery, 165 Gloucester Street until April 26th. Original generation time 0.3658 seconds. Original generation time 1.5880 seconds. Cache Loaded in: 0.0455 seconds.